Zac Power Tomb of Doom – Chapters 1 to 3. 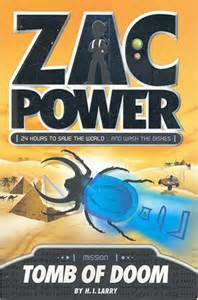 2nd Class are really enjoying their latest book, Zac Power’s ‘Tomb of Doom’. It’s an excellent book, full of adventure and surprise. We recorded a podcast this morning to fill you in on all we have learned in the book so far. We also practice saying our ‘Good Reader tips’ that help us to understand what we are reading and answer even more questions. Remember, you can catch our previous book/reading podcasts on the blog by clicking on the title!